Never let a good deed go unpunished. For example, if you brush three times a daily, floss daily plus after some meals, and see the dentist every six months, expect to have bad teeth. I cannot explain this phenomenon. It's true, though! I was innocently walking around, proud that I was using my planner wisely. Dental appointments are every six months, without fail. I have a budget to cover dental expenses. I have time in my day to brush my teeth. I have a shopping list in my planner and never forget to buy mouthwash. I have dental health covered. 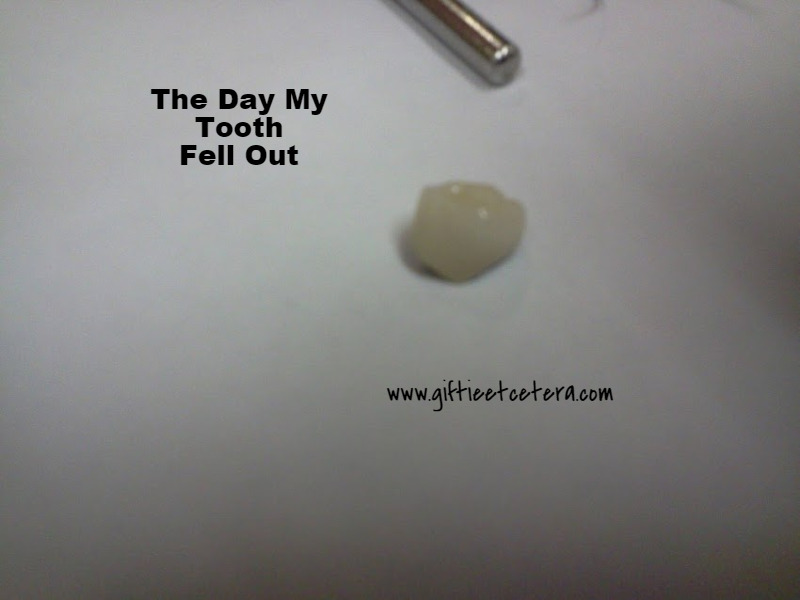 And then...BOOM...75% of my back upper right tooth FELL OUT OF MY MOUTH INTO MY HAND. Yes, this is the actual tooth. I HATE YOU, EVIL TOOTH. How could you betray me?!? When the HORRIBLE THING happened, I was sitting still in a parking lot, flossing my teeth after a yummy round of sushi with a girlfriend. My girlfriend and sushi date commented that both of her ongoing nightmares happened to me that day. I went outside without wearing pants and a tooth fell out of my mouth. I called my endodontist. Yes, I am organized enough to have my own root canal specialist. He removed the root, but I cannot see my regular dentist for extraction until Monday morning. I am writing this entry on a Sunday night. I am taking prescription strength ibuprofen and over-the-counter benzocaine, but I swear to all that exists that THIS HURTS MORE THAN CHILDBIRTH! I want to scream, yell, cry, and slice off the right side of my face. At least the HORRIBLE THING did not involve any of my front teeth. It hurts. And I have a blog, so I have a place to whine about it! I'm sorry that you had to endure this, but for the love of all that is holy, SEND PAIN PILLS AND CHOCOLATE! P.S. Don't really send pain pills. That violates many laws. P.S.S. Make the chocolate the melty kind. I can't chew peanuts and caramel right now. P.S.S.S. I'm pretty sure P.S.S.S. is a middle school thing, but I am typing while in lots of pain, so...I'm pretty sure my chocolate habits explains the falling out tooth. I like dark chocolate the most, you know, *if* you were wondering. P.S.S.S.S. 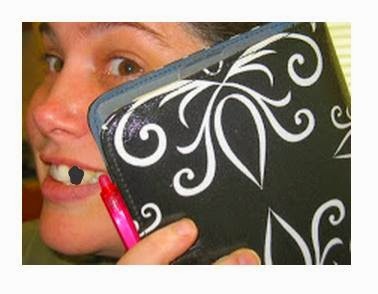 My planner has NO SPACE from tracking teeth that fall out of my face. I feel you pain! Literally. I've had over a dozen root canals and a fracture root. booooo. I hope you have some good pain killers. Aw. I hate dental pain. If I lived closer I'd have brought you some chocolate. However it would be a hot mess coming through the post. I hope by now (Tuesday in CA) you are feeling all better. How well I can empathize with your ordeal. Wow, that is crazy and I would have been so upset with my tooth falling out too. I entirely feel your pain! My teeth are horrendous, but I am lucky enough that when I lose tooth bits they aren't painful and they are towards the back! But tooth pain is the literal worst thing in the world...and it radiates and ugh *shiver* If its hurting on your face any, I also suggest icy hot. Sounds weird, but I've had horrible radiating pain on the whole side of my face before from tooth pain, and icy hot actually helped a bit (along with ibuprofen). Been there. Done that. Probably have the t-shirt and a couple of coffee mugs. My teeth are just a disappointing mess. So sorry to hear! I've never lost a tooth, but lost a crown while sort of in the middle of nowhere (Congo.) Had to wait 5 days for a flight to the capital. I'll spare you the details of dentistry in the 3rd world. :) I had a nice French dentist, not forced to go to the govt clinic, but nothing I EVER want to repeat. Good luck! I hope the pain is taken care of soon for you! Ouch! I've had my front tooth "shear" right off. That's probably not the right word. If I had tooth veneers, it looked like the veneer had un-cemented itself off the tooth. Of course this happened on a Friday night, and my dentist was out of town over the weekend. Thankfully no pain. Just couldn't smile the whole weekend. Eating was no fun either. Sigh. This is not a funny topic!! I get the tooth pain. But you should investigate why your teeth are weak!! Calcium deficiency, Vitamin K2...? Sugar does cause decay, but - well it doesn't seem like you're that kinda candidate. Teeth actually do heal themselves. BUT not if you don't know why they are breaking off. I hope you feel better by now! My condolences on your tooth. Sorry I can't send chocolate. Interesting that your girlfriend has a fear of leaving the house without pants. Does she never wear dresses or skirts? P.S. I hate to add insult to injury, but P.S. is an abbreviation of the Latin, "post scriptum" or the English, "postscript." In either case, an additional one would be P.P.S. (post-postscript) not P.S.S. (http://www.todayifoundout.com/index.php/2010/08/when-adding-a-second-ps-at-the-end-of-a-letter-its-pps-not-pss/). Sorry, you can start throwing things at me now, and I'll leave the poor toothless lady alone. I completely agree with the P.S.S.S. comment. I did it for effect, just to demonstrate how much my pain was affecting my brain! This particular tooth was malformed and had an infected nerve. We knew about the underlying problem, but couldn't do anything about it earlier due to the malformation, which would have affected two healthy teeth. Extraction was the only solution, so we were waiting until we had to do it! Shame! So sorry to hear about your dental issues. I've been having problems myself since last year June! Tooth pain is the worst!!!! And I was also really good to my teeth. I don't eat sweet things because I don't like them. As a child the dentists were always very pleased, and then one day, boom! The pain!!! Holes and infections everywhere. And as a singer, it really is not convenient. I hope you are able to get this sorted out soon. You have my sympathies.